Professional life is limited with various rules and regulations. These rules need to be followed strictly. There are different kinds of professional rules like office decorum, keeping cleanliness, uniform rules and wearing ID cards. 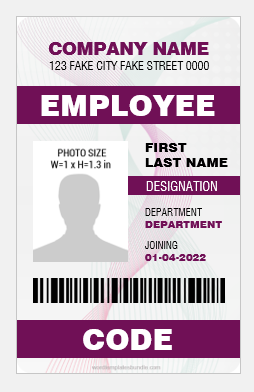 Proper wearing of ID card is very essential requirement at the workplace. It gives ease of communication as well as safety and security. 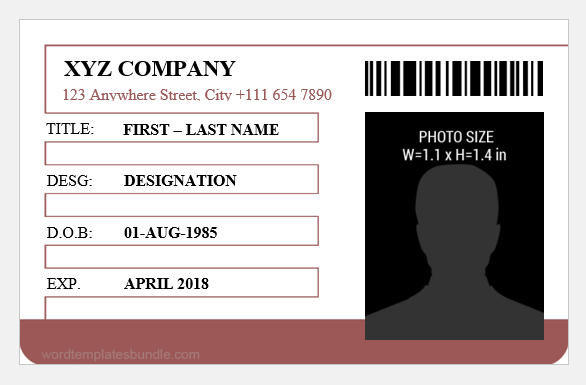 Following are different templates of ID card that can be used accordingly by each and every profession. These cards are printed in different colors. And, the colors have a strong influence on individuals both personally and professionally. 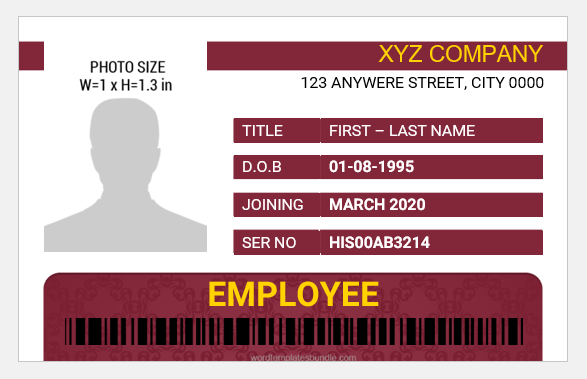 The ID card shown below is having the organization’s name and address as a first main part. The second part consists of the complete name, designation, validity, and date of birth. A fine-sized picture is printed appropriately. The color combination is decent and graceful. The plum color shows pride. The white color represents peace. This ID card can be used for almost every profession. This ID card is designed decently. It has two parts of grey and black. Grey color symbolizes realism. The picture is printed along with the QR code. The company’s name is written with bold font. Then the name, designation, date of birth and validity is mentioned. The ID card is devised appropriately. 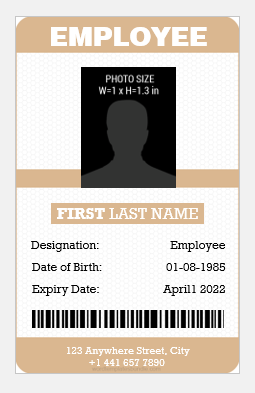 This ID card works best for the fields of construction, fashion, manufacturing, and mining. The Identity card as follows is energetic. The color blend used in the card is flexible. The bold font of the word employee with granola color gives a respectful sensation to the dignity of the employee. A mild pink background reveals charm. The grey color represents sophistication. Altogether, the card shows purity. This kind of card is good for professions like medical, dental, and sciences. The ID card shown below has a charming look due to pink color. The pink color symbolizes excitement and tenderness. It is designed very candidly. The word employee is written in bold font to clearly define that it is an employee card. One side of the ID card is with photo and barcode. The other side encloses the company name, code, designation, date of birth and expiry. This all information is enough to justify the identity card of an employee. This design works well for employees working in a music company, Media Company, and the film industry. The ID card shown below has an all-around look. Its font and color combination is very appealing to eyes. Grey color is always considered as a stable and practical color. The card shows the employee name on the top. A clear photo size is printed on the side with the whole name under it which is quite exclusive and upright. The logo is headed with the company name in the background. Additionally, the designation, serial number, date of birth, issued date and expiry dates are also mentioned appropriately. This identity card is suitable for any kind of profession. And, specifically, it can be chosen of veterinary and oratory organizations for their employees. This identity card is of a teal color. Teal color is refreshing and illustrates intuition. This ID card has a company name on the top. The complete name of the employee is printed along with the barcode. 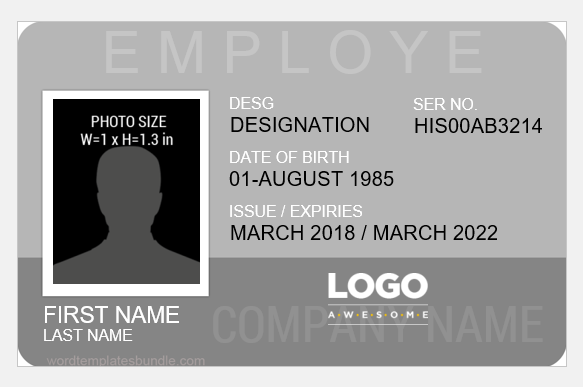 The photo size is fine and all the required elements of an employee ID card like designation, date of birth, and validity period are mentioned accordingly. 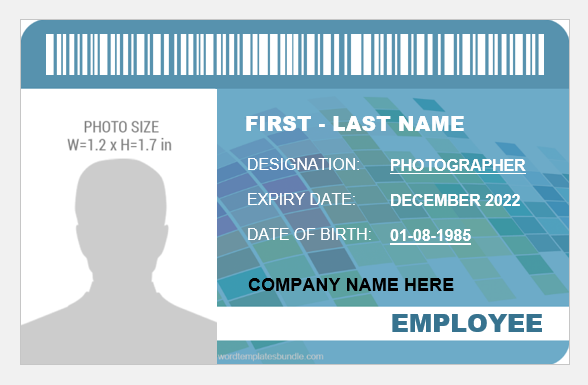 The ID card can be used for employees of all kinds of medicine companies. The ID card as follows is very vivacious. It is designed in a pleasurable way. The ID card is printed with gold color with a light pink background. The gold color is a symbol of success, fervor, and insight. The light pink color shows flicker. The company logo is designed on the top to clear visibility. The title, date of birth and expiry date and printed along with the photo and code number. The barcode and the word employee are printed vertically. 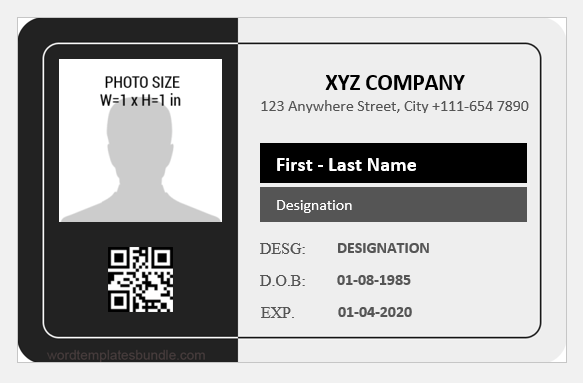 This employee ID card can be used by different companies like child day care center, food and drink companies, and entertainment companies. This Identity card is much dynamic. Its color and design are very mature and to-the-point. The color black is a proficient, commanding, and explicit color. The card has two parts. The left parts hold a photo and the name. The right part holds company name, address, barcode, serial number, date of birth and expiry. 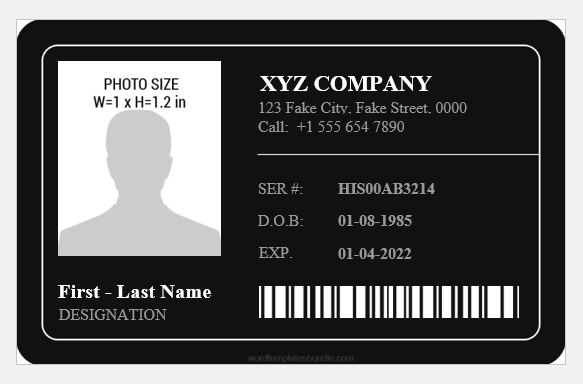 This employee ID card can be used for trading companies, oil companies, and the fashion industry. The identity card as below is with sapphire color. The sapphire color exhibits loyalty and security. The card is printed with a cool font that looks striking. One side has a bold size photo. The other side has the full name, designation, date of birth, and expiry date. The company’s name is written in the footer. The expression employee is highlighted with the background. 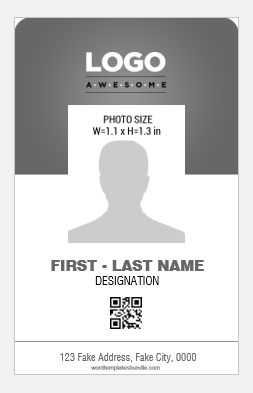 This ID card has a digital background which is expressive. 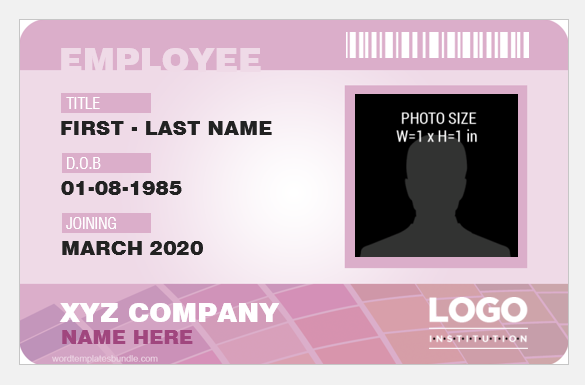 The utility companies, governmental organizations, and medical organizations can use this employee ID card. The ID card shown down is a blend of lavender and white color. The white color is spacious and fresh. The lavender color illustrates freshness and stability. The card seems much pleasing and fresh to due to the color. The expression employee is printed in the headnote along with the barcode. The picture is printed with the full name, joining date and date of birth. The company name and logo are printed in the footnote. This ID card is completely expressive. It is suitable for all kind of professions and exclusively it works best for banking and tourism businesses. 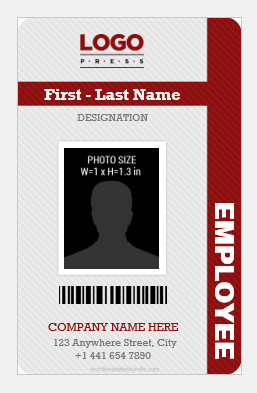 The employee ID card shown below is elegant. It has a mild white background representing faultlessness. Its theme color is plum color. A little yellow color is also used to highlight the company name and the expression i.e. employee. The plum color shows ambition and poise. The identity card has a photo on one side. The other side is enclosed with the company’s name, address, title, joining date, serial number, and date of birth. 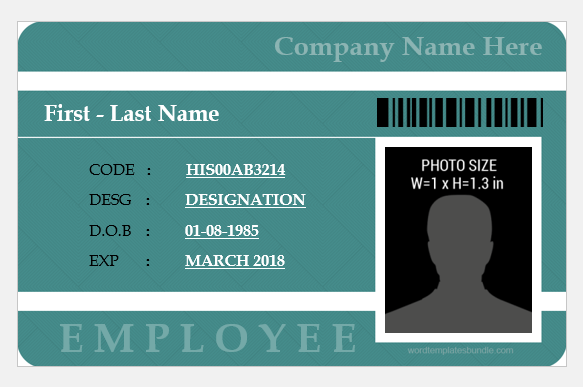 This employee ID card can be used in various companies. Exclusively, it goes best for the employees of healthcare companies, yoga and massage clubs, and law organizations. This employee ID card is very well-designed in slate color. The text with black and peanut colors collectively illustrates natural freshness. The brown color is always recommended to use for the font in all kind of professional papers or documents. The slate color shows balance. 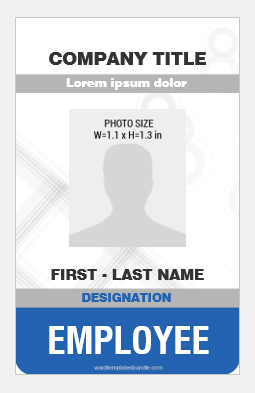 This ID card has a company name and validity in the header. A photo with the expression i.e. employee is on one side. The other side is enclosed with full name, date of birth and department. 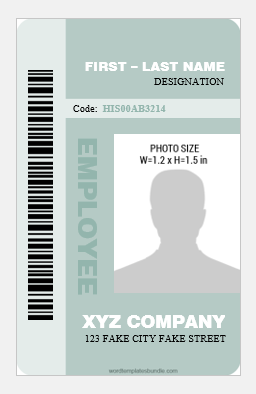 This employee ID card is suitable for information technology companies, corporate companies, and textile industries. The identity card shown below is of vertical shape. The ID card has two colors. The ruby color expresses self-assurance. The grey color expresses erudition. The logo is with bold font at the top. After that, the complete name is printed. The designation is headed on the photo. The company’s name, address, and barcode are printed at the footer. 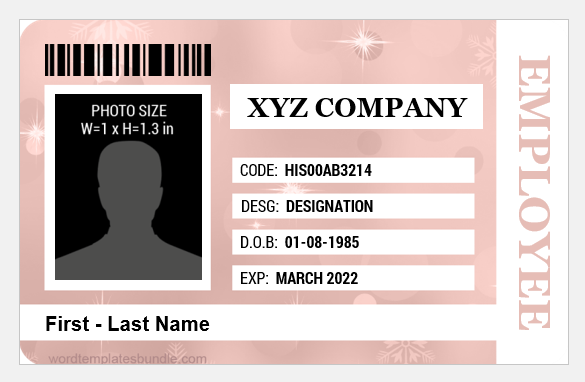 This ID card is best suitable for employees of hospitals, fashion companies, marketing companies. 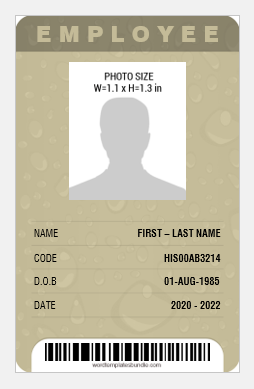 The ID card as shown contains sepia color. It looks simple yet pleasing to the eye. Sepia color associates to the purity of being natural. It also encloses reliability. The card contains the expression employee with a large font. Then a fine-size photo is printed. Then the full name, designation, expiry date and date of birth are mentioned. The barcode and address are mentioned in the header. This ID card can be chosen for the employees of NGOs and architecture field. 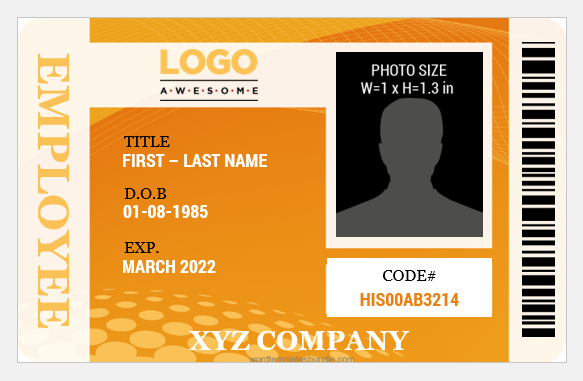 This ID card has a very attractive and eye-catching color. The stone color signifies freshness. Freshness is directly proportional to the charm in the profession in the eyes of the employee. The card has a complete name on the top with the highlighted font. The designation is printed right along with the name. The barcode is printed vertically. The code is printed with highlighted color. The photo is placed with the complete address. The ID card can be chosen by hospitals and schools for their employees. The identity card below has a very rich and shocking color combination. Purple color illustrates ambition and independence. The company name and address is placed on the top with a large font. 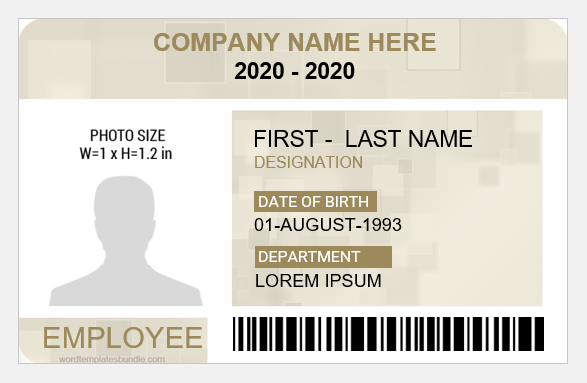 As it is an employee card, so the expression employee is printed with a highlighted background. The photo is printed beside the complete name, designation, and department and joining. The code is mentioned in the footer with the highlighted background. The card can be chosen for the lawyers, journalists, and analysts. The card as below is very unique and attractive. The background image sounds much versatile and intrepid. The color blue is a communicative color. The expression employee is placed on the header. The complete name and designation are mentioned together. The photo is printed beside the QR code and expiry date. The company name is placed in the footnotes. Overall the card is designed perfectly. This ID card can be chosen for all kind of professions. Particularly, it works best for employees of IT and software companies. This Identity card is very attractive and pleasant. It contains a combination of grey and white. The grey and white colors demonstrate balance and purity. The company’s name is placed on the top. The photo is placed in the middle that comes half in grey and half in white. It looks much dynamic. The full name, designation, QR code, and address are mentioned in the footer. This ID card can be chosen for dentists, pharmacists, psychologists, and veterinary doctors. 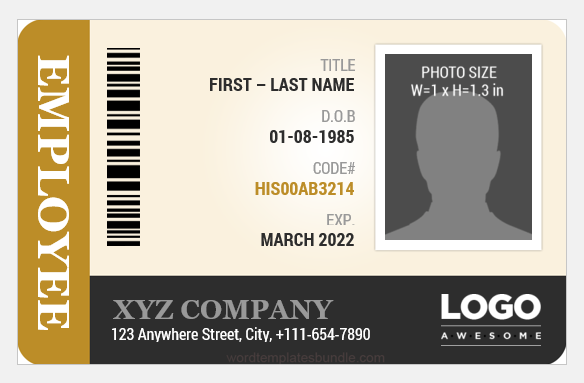 The ID card shown below is striking and contains an eye-catching self-print in fawn color. The beige color illustrates relaxation. The card looks very decent. The expression employee is placed in the headnotes. The picture is placed right in the top-middle. The full names, code, date of birth, validity are placed under the photo. The footnote contains the barcode. 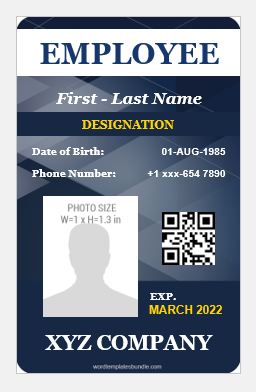 This ID card can be chosen for defense employees, and university and college employees. This ID card contains white, grey and blue color. These three colors collectively symbolize purity. The card is very plain. The white self-printed background is especially pleasing. The company title and address are printed on the top. The second part contains a fine-size photo. The complete name and designation are mentioned at the bottom. The ID card can be chosen for all kind of professions due to its simplicity.